So as of now I am loving this matte black 920. But I am just wondering how the 14 day return policy works. If I decide I do not want to stick with the color before the 14 days is up, can I exchange and pay a restock fee? Or do you have to have some non aesthetic reason for doing so? What was explained to me was that I could return the phone for any reason within 14 days, but I'd be charged a restocking fee. So it doesn't matter what your reason is. Restocking fee for a return, but what about for an exchange? An exchange is not charged a restocking fee as long as you are exchanging it to the same color due to some manufacturing defect with your current device. If you are exchange it for the reason you did not like the color, they would charge you the restocking fee. Basically what I was wondering. I would assume they wouldn't mind considering they are still keeping your contract by doing so. The restocking fee is just like $25 though right? It's $35 if you buy it from AT&T. (Disclaimer: I work in a COR AT&T store, but this post is all me). 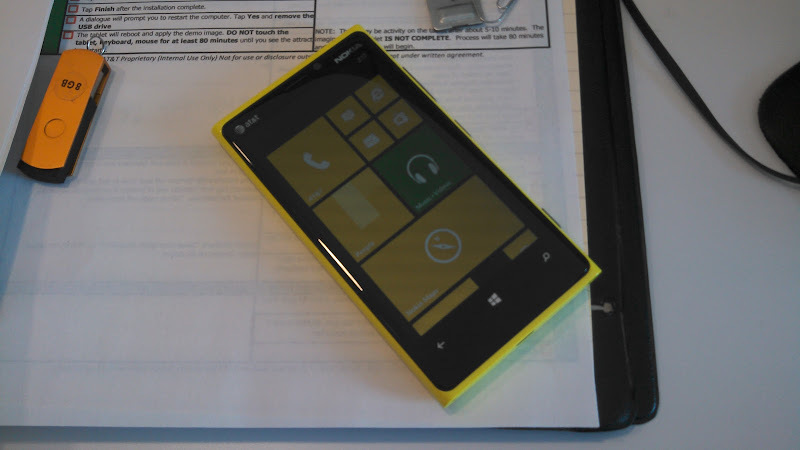 BTW, I got a yellow one as my company phone today. Big Bird ain't got nothing on this love. So how come so many AT&T and Microsoft Store employees got yellow L920s but none are available for sale in-store? Shouldn't have canceled the original order man. My cyan shipped today finally. If it was a matter of volume, you'd think there'd be one or two extra lying around to sell... not so if this forum is anything to go by. Honestly, black and white sell the most no matter what the phone is...I hardly ever sold a cyan 900 because for the average guy, it was off-putting. Red should sell well here (I'm in Nebraska), but I don't know about cyan and yellow. They are available online, plus I can order them and have them shipped as well, just like any AT&T store. I think I like the matte black with cyan tiles more. If the entire phone is Cyan I wouldn't really like having my tiles any other color. I've heard this argument before. Sounds similar to the weight issue to me. But to each his own. Hope you're enjoying the phone. Cant wait to get mine. How is it in anyway similar to a weight issue? One is a personal aesthetic taste, and the other is a physical claim. I already have a surface with a cyan touch cover and a cyan wireless mouse to go along with it. If my entire phone was cyan, that much cyan might put me into a cyan coma. I already have a surface with a cyan touch cover and a cyan wireless mouse to go along with it. If my entire phone was cyan that might just cyan my break into a comma. Lol yea I can see too much cyan getting kinda nauseating. @krisguy. I picked up my white 920 at a corp store yesterday and then less than 12 hours later dropped it and shattered the screen. Do I have to go through the insurance or can I take it into the store when they open? And either way, can I get the black matte one as a replacement so it isn't as slippery in the hand? I think it all depends on location in many cases. Lots of guys (and gals too) are sports fans. Red would probably be a big seller in Nebraska (Cornhuskers), Ohio (Buckeyes/Cincinnati Reds), California (Stanford), Boston (Red Sox), Chicago (Bulls). Cyan would appeal to folks in California (Bruins), Miami (Dolphins). Yellow would be perfect for people in Pittsburgh (Steelers), LA (Lakers), Iowa (Hawkeyes). I'm surprised you were able to tell what I was saying. No idea what happened with my sentence but it got destroyed at some point lol. And like I said, I don't anticipate wanting to take my black back at any point. I am just wondering what my options are since I did just renew a 2 year contract for the first time in like 4 years. The only problem I am having with black, which may sound weird, is that with the matte, it's almost TOO black. By that I mean like in the dark, sometimes it's hard to tell the orientation of the phone. And if it's really dark, it can be touch to tell the boundaries of the phone and I almost feel like I'm going to drop it. Other than that it looks amazing with any tile color you use in dark/light or high contract. Which I like.